Since branching out to be self hosted I’ve had some wonderful support from my sponsors, and I wanted to share some more information about them with you. This is partly as a thank you to them, but also because I selected designers and companies which I thought would be of genuine interest to We Heart Vintage readers. 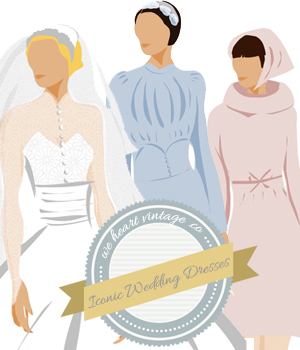 The first sponsor in the spotlight is London-based retro boutique: Darling. Darling is the vision of Nadia Moraes, the London based designer who founded the label. As an independent boutique owner, Nadia spent many years sourcing pieces for her shops and was inspired to launch her own collection by the lack of affordable and stylish and vintage inspired clothing available. With no formal training in fashion design but a keen eye for beautiful fabrics, unique embellishments and shapes that flatter a woman’s figure, Nadia creates pieces that she loves to wear. The Darling look is elegant and pretty, with a dash of British eccentricity. This season, Darling has drawn inspiration from the Swinging Sixties. Channel beatnik in the black Shayla tunic with contrasting white Peter Pan collar and a flick of eyeliner. The monochrome Winona dress has a feminine silhouette with a sixties style collar in floral appliqué. One of Darling’s signature fabrics; lace, goes brighter and bolder this season. Statement pieces include an elegant long length pencil skirt in electric blue lace, a coral and grey lace biker jacket and a lime green lace clutch. Across the range, Darling has taken the colour palate up a notch; expect emerald green, coral, tangerine, turquoise, and yellow, alongside the signature soft blush tones and chic neutrals. The Darling girl loves the vintage look and this season she’ll be revisiting the 1920s. The Sophia blouse is delicate, feminine and with a touch of old fashioned elegance. Or pay tribe to the Great Gatsby era in the Madison charcoal top with embroidered collar and the Morgan palazzo pants. The accessories line has evolved to include a covetable collection of clutches, day bags and purses as well as newly introduced weekend and evening bags and purses as well as newly introduced weekend and evening bags. A three dimensional floral box clutch is the perfect party piece. I’ve picked some of my favourite pieces from Darling’s new spring collection (below) – which is your favourite?